Tucked in a cozy corner of one of Pilsen’s numerous loft office spaces sits the headquarters of the Chicago Public Art Group. The CPAG was formed as a collective of artists in 1971, and comprises one of the first racially diverse groups of its kind. From the onset, its mission was to use art to address the unique issues faced by communities throughout Chicago. "Our goals continue to be today to have art be a way to bring people together and help them think about their communities, their identities, and be able to make Chicago a little bit more meaningful," Executive Director Steve Weaver said. One piece which aims to do just that is the restoration of the Galeria Del Barrio, originally created by artist Aurelio Diaz in the early 1970s, and its twin image, Weaving Cultures. Both can be found on Blue Island and 16th street in Pilsen. Commissioned to complement the original piece, Weaving Cultures sits across the street from Galeria Del Barrio and was created by female artists Sam Kirk and Sandra Antongiorgi. "That actually features what we believe is the first transgender woman in a mural in Chicago," Weaver said. Over the years, the Chicago Public Art Group has worked on more than 200 projects, including murals, mosaics, sculptures and interactive art pieces. One thing that sets the group apart is how eagerly members welcome the input of community members in both the planning and execution of the art pieces. Andy Bellomo, who has worked with the group for more than eight years and completed more than 30 art pieces, said that input from the residents is crucial to designing a piece that accurately represents a community. From this dialogue between artists and the public comes some of the most vibrant and relevant masterpieces. Pieces like the tribute to Martin Luther King Jr. which was erected in Marquette Park in conjunction with the Inner City Muslim Action Network. It honors Dr. King’s march for fair housing, and consists of three ten foot pillars made of brick with images from the march carved into them. The project took nearly a year to complete, and is one of the more ambitious projects of the CPAG to date. Around the sculpture are benches made up of tiles created by community members, each with a different symbol encapsulating their ideas of home. Public art plays many roles, and can help address the needs of communities in fresh ways. Bellomo said that for many residents museums and galleries are inaccessible, and these public murals are a way to bring art into their reach. Weaver suggested that public art is a medium for exploration of a community's needs beyond the basics of housing, jobs and education. “Communities need a chance to reflect, to think about what they value, and art can help to humanize a neighborhood in a way that a brick building may not,” he said. This is especially true in Chicago, where locales are often made up of incredibly diverse populations. Weaver said that it can be difficult for groups not to feel isolated, and it is challenging to find common ground when dealing with people from so many different ethnic and socioeconomic backgrounds. Art, he added, can be a way to create a common connection, to begin a conversation. 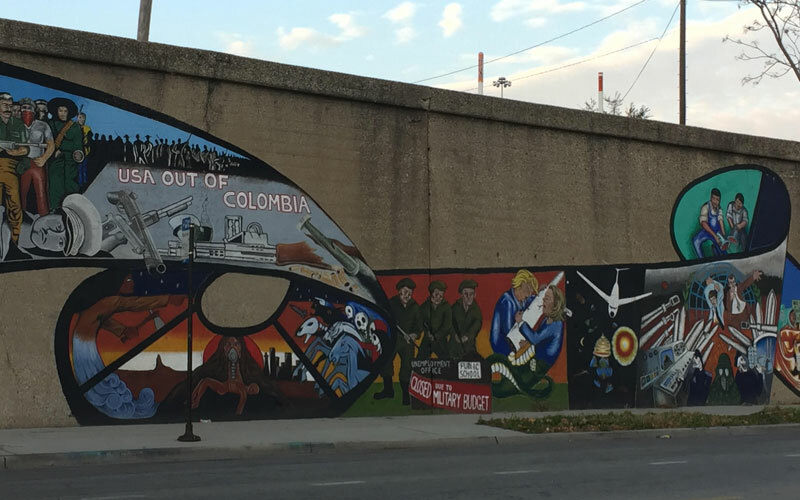 Prevent World War III, which sits on the corner of Western Avenue and 18th Street in Pilsen, has among its other images a depiction of President Elect Donald Trump and Presidential hopeful Hillary Clinton struggling over an armed missile. The piece, created by artist Marcos Raya in the 1980’s, originally featured Ronald Reagan and Jimmy Carter and attempts to articulate the fears and concerns of a new generation. It has since been updated with the new politicians. There are practical benefits as well. Weaver said that often completed art projects create impetus that lead to other improvements in the neighborhood. In Woodlawn after a mural in an underpass was completed, the alderman paid to have new lighting installed creating a safe space for residents. The Sepia Project, which was completed on Nov. 20, focuses on connecting and honoring the two communities of Little Village and North Lawndale. Created in collaboration with the 22nd Ward, it integrates the extensive water damage suffered by the underpasses of the viaducts and features sepia toned portraits of community members. “Viaducts in Chicago are natural dividers between communities so this is about connecting the two and honoring each,” Weaver said. One of the biggest challenges faced by the CPAG is finding the funding to continue creating projects. According to Guidestar’s report on the group, their budget topped $300,000 in 2014. They are supported by grants from foundations, donations from individuals, and through administrative and managerial fees from projects. That money goes to pay for the office space of the CPAG, which often doubles as an artist studio and also hosts an after school program to help at risk children and teens in conjunction with After School Matters. Artists are also paid a fair wage for their work, Weaver said. Mayor Rahm Emanuel declared 2017 to be the year of Public Art in Chicago. In honor of the 50th anniversary of Picasso’s sculpture in downtown’s Daley Plaza, $1.5 million will be provided to create and explore art in various forms throughout the city. Weaver said the mayor’s office has agreed to match all contributions from aldermen, and raising awareness among them is a priority for the rest of 2016.